Well, last night I dreamt that my dad was systematically analysing the merits of World of Warcraft. Highly significant, I am sure. My dreams are always thinly veiled attacks by my subconscious that don't even bother to be symbolic and never require analysis. More often than not I wake up thinking (to quote my brother), "Dude, seriously??" But I get the feeling that I am supposed to talk about my dreams in the general. I dream of being old and walking hand in hand with someone I love, like that couple I saw on the street the other day. I dream of being sixty and dying my hair blue and wearing eccentric capes. I dream of moving to another city, learning everything I ever wanted to know. I dream of spending a summer in the mountains and finishing "À la recherche du temps perdu". I dream of going skiing this winter and windsurfing next summer, and of time travel. I dream of writing a Sebald-style work of historical analysis which would be ignored by middle-aged German scholars and appreciated by everyone else. I dream of wearing a short pink sequin dress without being stared at. I dream of a fairer, more equal society. I dream of being really happy. I dream of an old-school BBC adaption of the Harry Potter books. I dream of the collapse of the right-wing movement. I dream of the Lucksmiths getting back together. I dream of living in an old house, older even that ours, like the people I saw when I was walking home in Edinburgh who spent the evening reading in their living rooms. Wallpaper, old furniture and older pictures were involved. 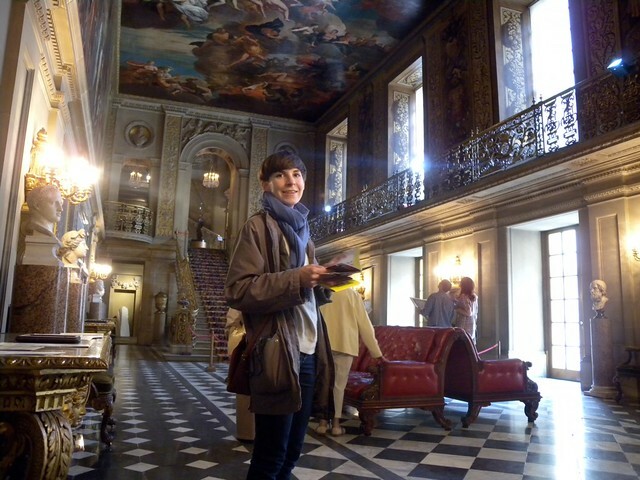 Sometimes I dream of living in a place like Chatsworth. I dream of asking people to record audiobooks for me because I like their voices. (Voices - almost as important as looks.) I dream of our confectioners deciding they've had enough of retirement so that I can eat their strawberry-yoghurt cakes again. I dream of my family staying healthy. And yes, I do dream of making the world a better place. real dreams mirroring a real person. lovely! And... strawberry yoghurt cakes? They have/had such things? I might start dreaming of these now, too. I GREW UP IN THE TIDIEST OF TOWNS.